Buffalo Bill is a legend. In the nineteenth century, he was famous for his Buffalo Bill Wild West Shows. This show traveled the world, bringing the wonders of the west to Europe and beyond. While the people of France might have seen plenty of circuses, they had never seen the rough manners and sharpshooting skills that the cowboys brought to the stage. The thing is, Bill didn't discriminate when he put out his casting call. If you were a champ shot and could ride rough (even in a corset) than you had a chance of starring in his show. From the cowboy band that kept the suspense in the crowd high to the stars shooting in the limelight, all sorts of people joined the show. And shock of all shocks, he even paid his lady performers the same amount as the men! Are you ready to hit the old dusty trail and bring the Wild West back into the public eye? This costume will surely light the flame of nostalgia for every dormant cowboy and cowgirl you meet. The jacket has dramatically long fringe along the sleeves and chest. The front has flowers climbing along the center panel that you can button up if the mountain weather starts acting up. You'll also get a thick, cowboy style belt as well as a red bandana. Ready to take your place of fame? Make sure you polish off the look with a good pair of jeans and boots, a classic white Buffalo Bill beard, and a wide-brimmed cowboy hat. And if you don't want to hit the saloon solo, no worries. 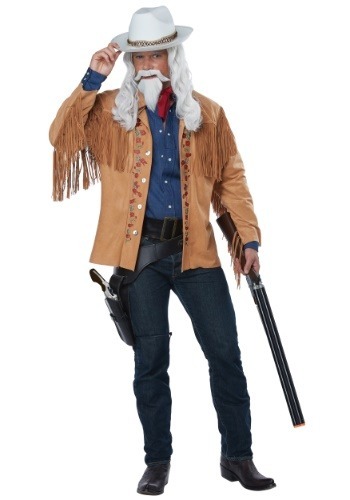 This can easily become a couple's costume when paired with our sweet Annie Oakley look. With the two of you together again, there's no stopping you from taking over the entertainment industry with that famous Buffalo Bill show once again!